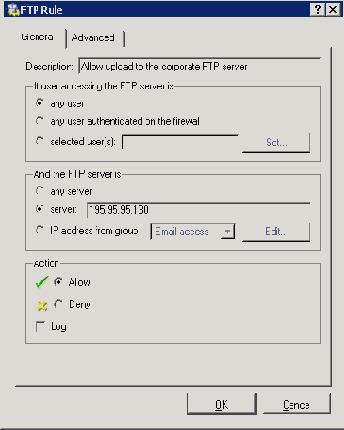 The IP address of the host where the appropriate FTP service is running must be used to define the FTP server's IP address. It is not possible to use only the firewall's external IP address from which the FTP server is mapped (IP translation is performed before content filtering rules are applied)! The same method can be applied to enable upload to a particular FTP server in the Internet whereas upload to other FTP servers will be forbidden.